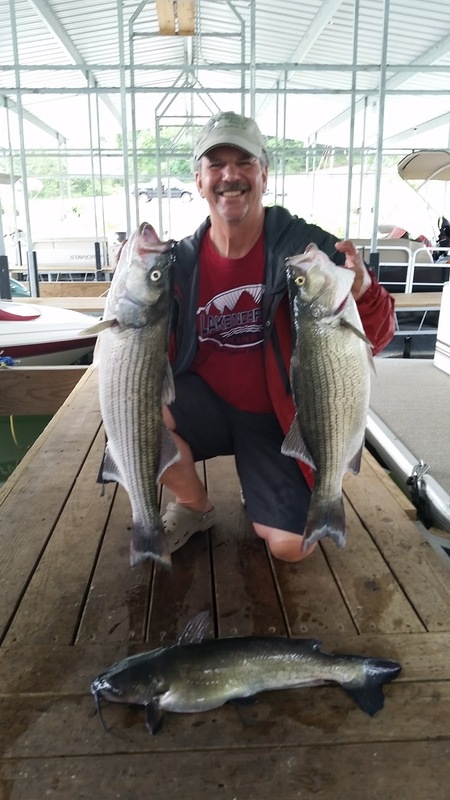 Norfork Lake fishing continues to be good for most species. The summer fishing pattern is in full swing and will more than likely last throughout August and into the beginning of September. The better bite for striped bass is located from the Point 2 area to the dam. 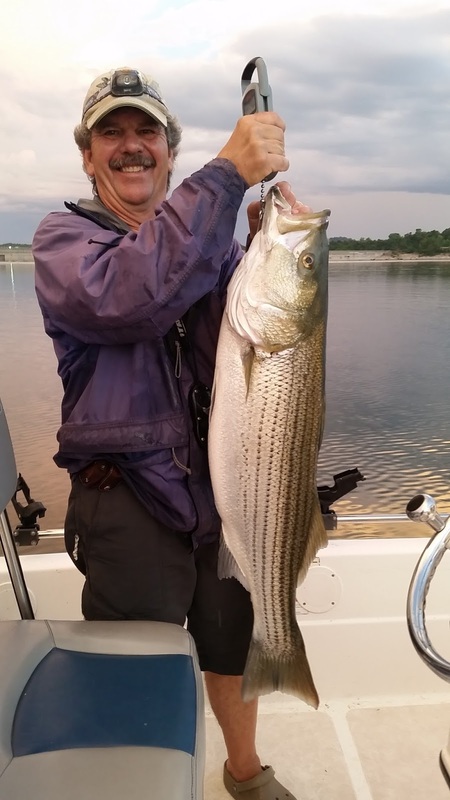 You can locate stripers on long points, as well as, on big rounded points. Before sunrise they are feeding in 30 - 40 feet of water and as the sun gets over the tree line they move out to deeper water 50 - 70 feet deep and even into the old river channel. Live bait is working the best for me, but I did jig up a few the other day with a spoon. I have been finding small schools of fish and most days they are aggressive, but over the last week I have had a few days that we had over 30 short bites with very few takers. Well that is why they call it fishing. :-) There has also been many big stripers being caught over the last couple of weeks in the 20 to the mid 30 pound range. I thought I was going to be spooled with the 25 pounder I caught a few days ago. If you are looking for other species of fish you're in luck. 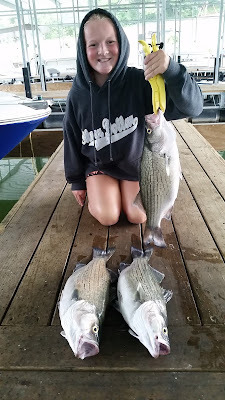 The white bass, largemouth and walleye are in 28 - 35 feet of water. The best time to fish for them is from sunrise until about 9 or 10AM and then again about an hour or so before sunset until it gets too dark to see. Minnows and nightcrawlers are working. I enjoy vertical and/or horizontal jigging with a spoon. I have been using a 3/4 ounce spoon that the main color is white. You need to bounce the jig off of the bottom and set the hook once you get hammered. 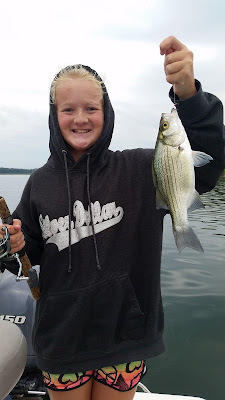 Look for these fish on the large shallow flats or the shallow side of the shoreline. You can find the whites and the largemouth on your depth finder, but the walleye have been hard for me to see. Catfish are in the same target depth as the white bass and they are biting really well at this time. Vertical jigging and crawlers are working well. The lake is still in great shape for summer activities and will be through the month of September. 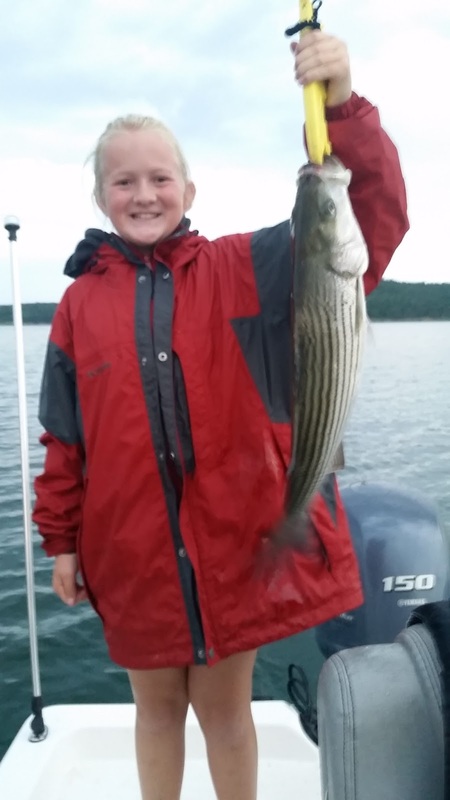 Kids are heading back to school though which means more cabins are available, and the fishing season is upon us. Start making your plans to catch the fish of your dreams. Give us a call at 870-492-5113 with your questions and to make reservations. The Norfork Lake surface water temperature this morning was 87- 89 degrees. The lake level is holding fairly stable with a few hours of power generation and currently sits at 553.11. The main lake is clear and most creeks and coves are stained.